Here we are, two weeks post-surgery. I’m glad that two doctors warned me about how tough this was going to be, because I really believe I’ve been able to manage my expectations and emotions really well because I had a realistic picture going into this. The actual surgery went perfectly. The morning of May 5, we had to be at the hospital at 5:30 am (yawn). 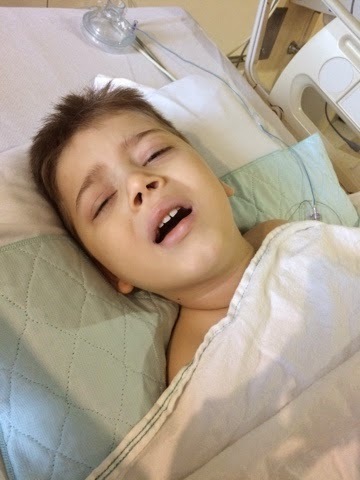 After much discussion between multiple doctors about anesthesia, consent forms to be signed, and whatever else takes so long to get these things started, the actual surgery didn’t begin until 9:45. We got several updates during the 5 hour surgery and each time it was reported that things were going really well. 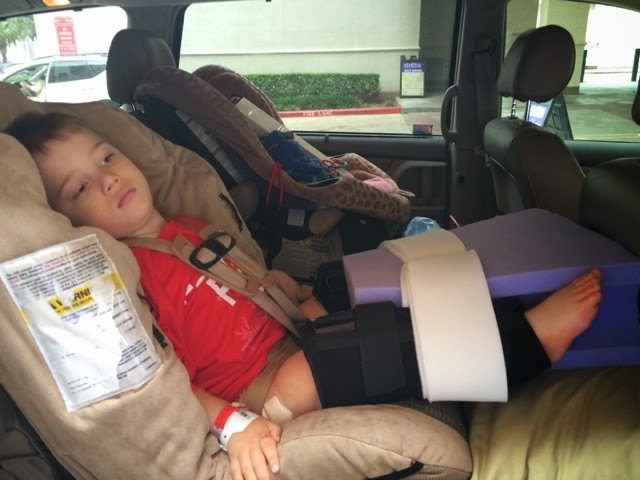 The surgeons were able to do the hips as well as reconstruct the pelvis, and Grayson did NOT have to be put in a spica cast. This was all fantastic news and what we’d been praying for. The first night was probably the hardest, although the days and nights of the next week completely ran together. 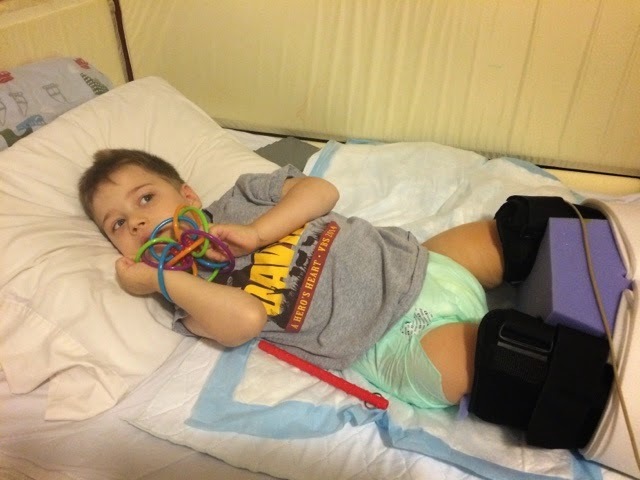 Grayson was in a lot of pain and required morphine almost every hour through his IV. He had an epidural that stayed in until Saturday morning, but it didn’t do enough to stop him from hurting. Thankfully, he was cathed until Friday so I had a few days where I didn’t have to change his diaper, which is what I was most worried about. 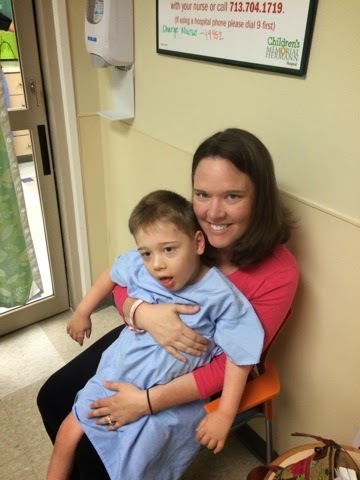 By Friday, the surgeon was ready to let us go home, but I knew we were nowhere ready for that. 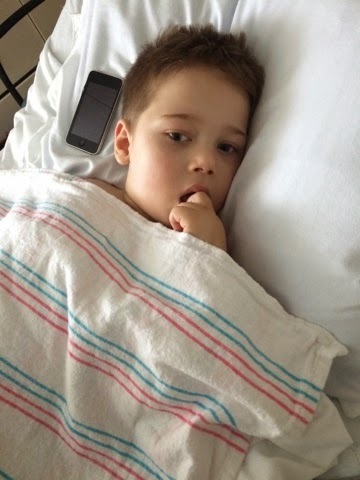 Grayson still had the epidural, was requiring way too much IV pain medication, and I still, after days of asking, had no answer on how we were supposed to get him home, transport him for the next 6 weeks (his wheelchair wouldn’t work) and if we were going to get additional nursing hours. I was SO stressed about this because by this time we were having to change diapers and it took 2, sometimes 3 people to do it- along with a hurting and crying little boy. I had no idea how I would do it without extra help. We ended up going home Tuesday, a week after surgery. Insurance hadn’t made a decision on whether or not to cover the wheelchair G needs (and as of today, they still haven’t- grrr) so I ended up just renting one. Unfortunately, we weren’t able to get any additional nursing hours, but it’s worked out so far. Our incredibly kind and generous nurse moved in Tuesday afternoon when we got home and didn’t leave until Saturday night! She loves G so much and takes such awesome care of him. We’ve been home a week now, and are surviving. 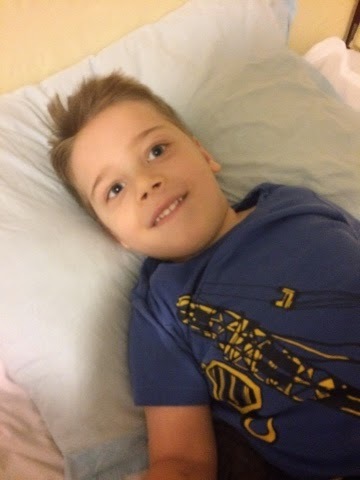 The most difficult part has been pain management and keeping G comfortable and entertained. That part is so hard because there is so little he likes to do- Veggie Tales, some YouTube videos, and playing his guitar is about it. It’s really hard not to be able to hold and cuddle him. Diaper changes are not nearly as hard as I had feared- I can do them by myself now and think I’m getting better at it every change. 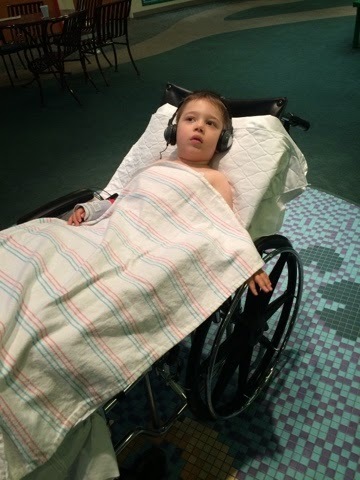 Grayson is still needing pain medication every 6 hours and definitely let’s us know when he needs it! I really hope we are able to cut back on the medicaiton soon because I hate that I’m having to give him so much. We had a follow-up with the surgeon yesteray- we were certainly a sight rolling into the office with a bed on wheels! The surgeon said everything looks great; he adjusted the braces and pillow and removed the bandages from the incision sites- G is certainly going to have some impressive scars! We go back in a month and hopefully will be able to remove the braces and pillows then. 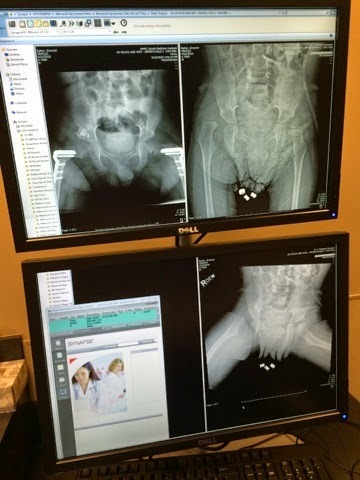 I took a picture of the before and after side-by-side x-rays at the appointment- “after” is on the top left. Look at all that hardware! If you look at the pictures on the right, you can really tell how badly dislocated G’s right hip was prior to surgery. 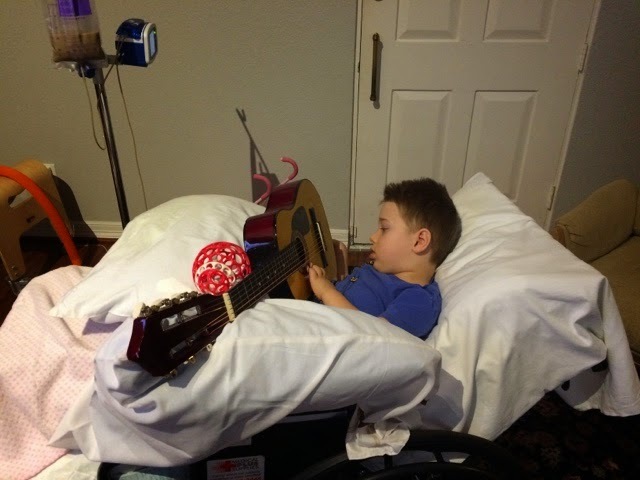 This kid is my hero, and the toughest person I know. I am so, so thankful that although it hasn’t been fun and we have a long road ahead, Grayson is doing as well as we could expect at this point. 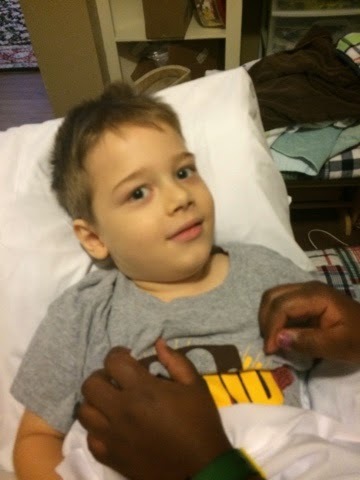 I apologize for not updating here in weeks, and for leaving some of you hanging who have been so supportive of our decision to go through with Grayson’s hip surgery. His surgery was ten days ago, and yes, things have been incredibly hard and exhausting, but also have been best case scenario in almost every aspect. I promise I will write an detailed update of the surgery and how his recovery is progressing, but tonight just isn’t the night. Tonight is the night to fall into bed at 7:15 and catch up on TV that I’ve missed over the past week and a half. Again, thank you for your words of encouragement, prayers, and support. We are here, surviving. And even smiling some.